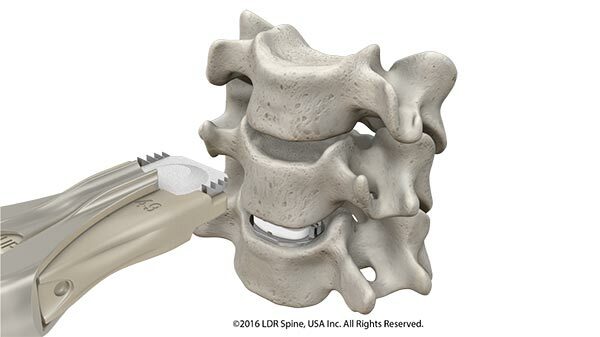 This device, the first and only cervical disc replacement FDA approved for both one and two-level applications, was the subject of a rigorous FDA Investigational Device Exemption (IDE) trial. In the study, the two-level cervical disc replacement procedure demonstrated an overall study success rate of 69.7% as compared to traditional cervical fusion results of 37.4%. At 24 months, those who received the two-level cervical disc replacement during the trial phase also returned to work on average three weeks earlier as compared to those patients who were treated with cervical fusion. The disc replacement patients also had lower rates of subsequent surgeries and reduced rates of ongoing degeneration at spinal segments adjacent to the surgery. What is a cervical disc and what indications might mean a problem? The cervical spine has discs between each bone that provide cushioning for movements and body loads. The discs and bones in a healthy neck allow bending from side to side and front to back, and turning left to right. Disc problems can start from over-use, an accident, or just the wear and tear of daily life. Degenerative changes in the discs may result in damage that can cause pain. When a disc degenerates it can have tears or cracks that lose water, which cause it to become thinner and provide less padding to absorb movement. 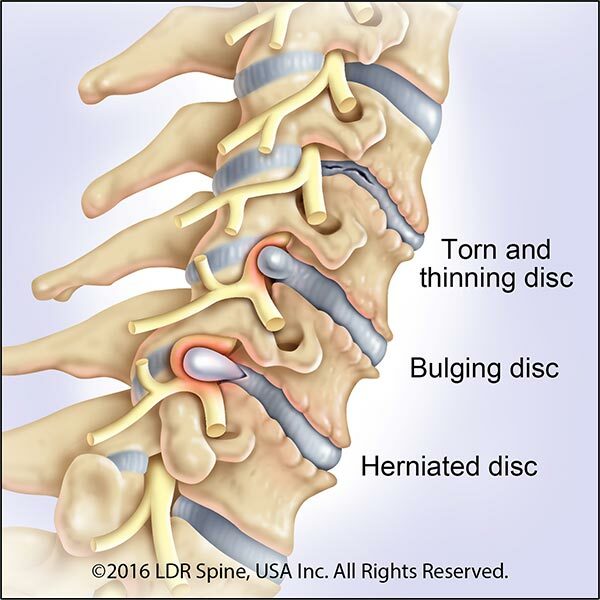 Degenerated discs can also bulge (herniate) and pinch the spinal cord or nerves, which causes loss of feeling, weakness, pain, or tingling down the arms and hands. Before artificial discs were available, patients would often receive an Anterior Cervical Discectomy and Fusion (ACDF) procedure to alleviate the pain from a herniated disc. In a fusion surgery, the disc is removed and either a bone spacer or a plastic implant will be placed in the disc space to restore disc height and remove pressure on the pinched nerves or spinal cord. A metal plate and screws can be placed on the front of the neck to hold the implant in place. The result of this procedure will be a segment that no longer moves, or is “fused”. The potential downside of a fusion procedure, in addition to the loss of motion, is that it can create additional stress on the spinal levels above and below it. This can cause degeneration at those levels and potentially result in another future surgery. An artificial disc like Mobi-C is an option instead of a fusion that will also be placed inside the disc space to restore height and remove pressure on the pinched nerves. However, the Mobi-C device is designed to allow the neck to maintain normal motion and potentially prevent the adjacent levels from degenerating, possibly preventing future surgeries. What does the Mobi-C Procedure look like? Mobi-C is designed to replicate the natural motion of the cervical spine. In addition, the mobile core is designed to reduce the stresses between the implant and adjacent bone, eliminating the more invasive fixation features found in other cervical disc replacement devices. Mobi-C provides bone sparing fixation without chisel cuts into the small vertebral bodies of the cervical spine. Competitor’s discs achieve their fixation by drilling keel cuts or screw holes into the bone, which can prevent safe implantation at two levels. Mobi-C was designed without a keel and therefore to be specifically applicable for both one and two-level indications. What does the post-surgery possibly look like? Patented Mobile Core Technology™ allows the Mobi-C disc to angulate and slide in multiple directions similar to natural cervical motion. The greatest clinical benefit of artificial disc replacement with Mobi-C compared to cervical spine fusion were seen in two-level indications, particularly in reoperation rates and disability improvement. In the Mobi-C clinical study, patients returned to work on average one week faster (one-level patients) and three weeks faster (two-level patients) compared to fusion patients.